Simon Reynolds is one of the most critically acclaimed music journalists of the past decade and has found himself the authority on both 90’s electronic dance music and the post-punk movement of the late 70’s and early 80’s. If his 2006 release Rip It Up and Start Again: Post-Punk 1978-1984 is mashed potatoes, it’s companion, Totally Wired, is the gravy. In Rip It Up Reynolds documents six extremely exciting and important years in musical history that were previously unspoken for. As suggested by the sub-title, the bulk of Totally Wired four years later is interviews with musicians, producers and icons. While doing research for Rip It Up Reynolds conducted numerous interviews; he culled the list down to the best thirty-two, and those with Jah Wobble (PiL, bassist), Alan Vega (Suicide, singer), David Thomas (Pere Ubu, singer and poignant yet jingoistic prick), David Byrne (Talking Heads, singer/guitarist), Lydia Lunch (Teenage Jesus and the Jerks, singer/guitarist), Steven Morris (Joy Division, drummer/New Order, drum programmer) and Paul Haig (Josef K, singer) are most captivating. There are some anecdotal redundancies with its preceding narrative treatment, but it is much more interesting to hear the stories straight from the post-punk horses’ mouths. To highlight the stories would spoil this read. Several of the artists are extremely well-spoken (and well-read!) and Reynolds is a talented and clearly well-researched interviewer. 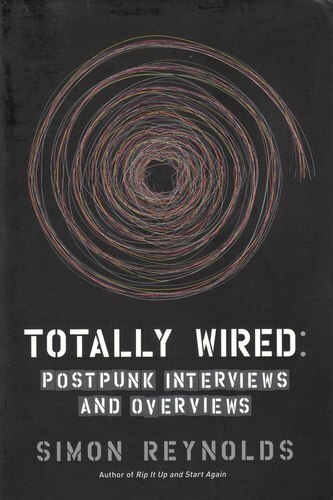 Aside from shedding light on countless personal backgrounds, band drama and musical/literary influences, Totally Wired also offers multiple sides to some post-punk coins, for instance producer Dennis Bovell’s approach and in-studio treatment of The Slits’ Ari Up and The Pop Group’s Mark Stewart. Reynolds packages the interviews in such a fashion that each story runs into the next with recurring characters, themes or scenes, creating a sense of cohesion unless he’s forcing a counterpoint. The last quarter of the book is dedicated to a handful of critical essays and Reynolds’ self-interview. The essays on topics including John Lydon and PiL, the two Joy Division movies of the 2000’s and art/concept rock are a bit lackluster. It isn’t that the subject matter itself is boring; instead the essays feel like term papers cut short which is a bit surprising considering Reynolds’ somewhat regular slips into verbosity in Rip It Up. The self-interview is rather self-serving (go figure) and it could have been more compelling, but Reynolds does highlight some important concepts. First of all, he pays ample homage to those music journalists that came before him writing for publications like NME, Melody Maker and Sounds. The music industry has changed so much in the past three decades with the emergence of MTV, the internet and file sharing. Without the influential publications of the 70’s/80’s mentioned above and the likes of icons like Radio One DJ John Peel (also interviewed for the book), it would have been nearly impossible for anybody to discover these great bands. Another of Reynolds’ accomplishments in his self-interview is providing a logical connection between post-punk and New Pop, a concept that was glossed over in Rip It Up. The musical edginess of post-punk bands like Gang of Four and Swell Maps sounds virtually nothing like New Pop’s ABC and Orange Juice, but Reynolds maintains that there is an aesthetic dovetailing. According to Reynolds, “pop” was never a “dirty word” in Great Britain, but rather a market to be infiltrated. The idea was to be as weird and challenging as one so chose and still hit the Top of the Pops. This message was garbled crossing the Atlantic, sublimating influential New Pop bands like The Human League into the realm of one-hit-wonderdom, sandwiched between American New Pop shlock. Other bands were simply transitioning and/or exploring, though sometimes viewed as selling out; think Joy Division’s shuffle to New Order after the death of leading man Ian Curtis or, as Reynolds would say, Scritti [Politti] Mark I and Scritti Mark II. I would definitely recommend Totally Wired; however, I would first recommend reading Rip It Up and Start Again if unfamiliar with the post-punk scene for some frame of reference. After all, gravy isn’t much good unless you have something pour it over. With the possible exception of highly informed musicomaniacs that lived through the period covered, Rip It Up is the type of book that will introduce at least a half-dozen artists worth discovering. Totally Wired is meant to place those artists in a more personal, artistic and socio-political context. It could stand on its own, but it wouldn’t be nearly as amusing.